Is the holiday excitement swirling at your house? Bet you’ll like these Christmas crafts for kids the ideas will keep them happily busy! The Hand Print Wreath is an especially charming version and the boys will love getting their hands and feet dirty making the Candy Cane Craft, Penguins, and Super Sweet Snowman Feet! Reindeer Drink Stirrers will spruce up your Christmas party eggnog. Keep all those holiday cards organized with 10 Unique Ways to Display Christmas Cards. Check out these 5 Awesome Downloadable Elf on the Shelf Letters, Ideas and Templates. Check out the ornaments kids can make, too! There are Paper Straw Christmas Trees, Yarn Ball Ornaments, and Snowman Ornaments. The other cute ideas in this post include an Egg Carton Reindeer Craft, Winter Luminaries, Paper Plate Elf Craft, Snowman Gifts in a Jar, and a delightful Christmas Kindness Countdown Chain. If you’re looking for a new Christmas season tradition, Grow a Candy Cane is such a fun idea. Ho-ho-ho! Christmas just got merrier! Who knew tracing your child’s hand print on shades of green cardstock could result in this adorable and sentimental hand print wreath? 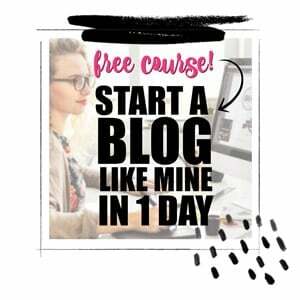 Now, you do! Using snow texture paint you can make these gorgeous winter luminaries that look like they are covered with freshly fallen snow. 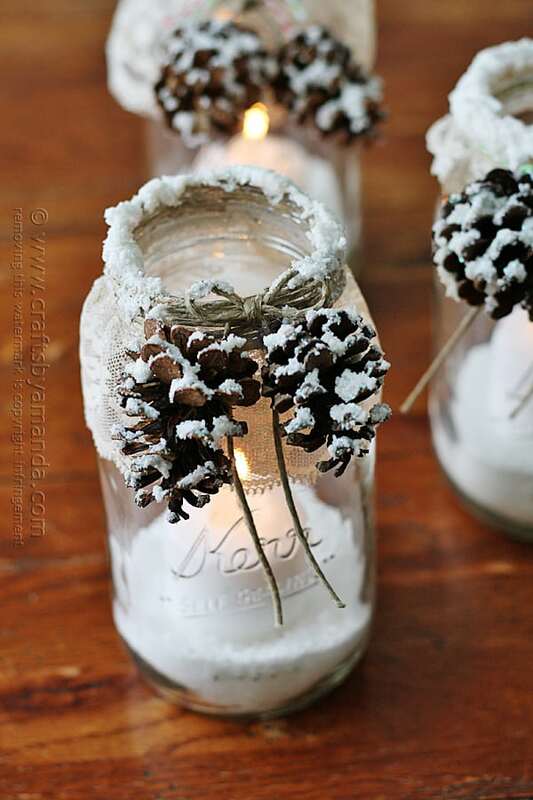 They are perfect for decking your holiday halls and are simple to make! Perfect for kids of all sizes and ages, this darling penguin footprint art project does require a little bit of adult supervision and some basic craft materials like black paint. But isn’t the result worth it? So cute! Gift these super sweet snowman feet canvases to family members! They will love looking back at the tiny toes turned snowmen! Supplies are pretty simple, but the impact grand! Don’t you just love easy and inexpensive Christmas crafts? These reindeer drink stirrers incorporate products that can be found at your local dollar store and can be assembled in minutes! Score! Children will love DIYing their own yarn ball ornaments! Some yarn, a foam ball, plus a few simple embellishments and instructions later and they’ll be adding a cute yarn ball to your Christmas tree! Start saving all of those baby food jars (or get your friends with babies to save them for you)! You’ll be amazed how cute these snowman ornaments are made from the baby food jars and a little acrylic paint and a piece of ribbon for hanging! Who doesn’t love a good paper plate and tissue paper art project? Kids will love crafting elves using glue, tissue paper and construction paper! 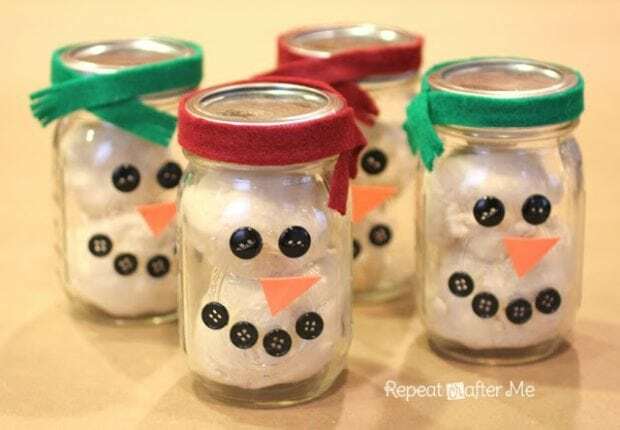 Repurpose old lidded glass jars into these adorable snowman gifts in a jar! A simple sparkly snowman playdough recipe and a few craft supply embellishments later and you have a darling gift for your children to give to their friends! Help your children get into the true spirit of Christmas by downloading, printing and assembling this Christmas kindness countdown chain. Doing daily acts of service in the month of December is a great way to celebrate the season! Grab your cute paper straws and get crafting these paper straw Christmas tree ornaments with your kids! This craft does require a bit of supervision because hot glue is involved. 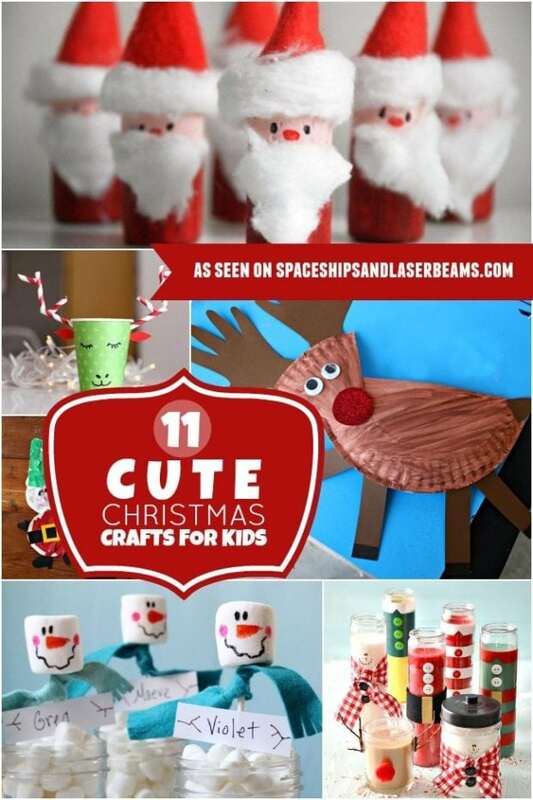 Celebrate the holiday spirit with these festive craft ideas gathered by the team at Spaceships and Laser Beams. Check out more great holiday DIY ideas to keep you and your kids busy. Don’t miss these 20 Hacks for Holiday Entertaining to help make your next gathering less stressful. Make this DIY Hanukkah craft with your kids. Your kids will love making these Christmas Ornaments Made with LEGO.